The other day while working at my local coffee shop I was surprised to learn that someone ahead of me had left extra cash to cover drinks for the next several customers. So, I got my drink free and then chipped in the $5 cash I had to keep the pool going. 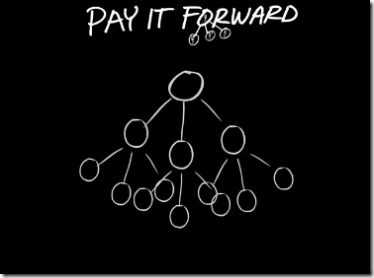 Perhaps you have also been a benefactor of paying it forward, or have even paid it forward yourself. While no hard numbers exist on the trend overall (and it is loosely defined at best anyway), instances of it seem to be increasing. For examples, the 500 free coffees trend that hit Canada this summer (and later, free hot dogs). Another 55 drive-through customers in a row paid it forward at a donut shop in MA. Or the unofficial record of 228 people paying it forward at a Tim Hortons. As with many trends, the exact reason(s) underpinning it are hard to know. Perhaps it’s just a fad with every news story just propagating it further. Maybe people want to show that we can still all get along, despite what the behavior in Washington suggests. Or it could be that we just want to spread a little cheer. As Sarah recently wrote about, perhaps it’s just another way alternative giving is growing. Whatever the reason or reasons for paying it forward, the benefits – kindness, gratitude, and the cascading effect – of such actions seem to outweigh the relatively minor cost. If you’re a business, how can you benefit from this trend? Probably the easiest thing you can do is make it easy for people to pay it forward. Or, consider paying it forward to your customers as Starbucks recently did through their “Come Together” campaign. Trying to promote it too much, however, may make it seem like an expectation or an attempt to try to profit from the act, stripping the randomness from the random act of kindness. And for everyone else, if you’re looking to spread a little extra holiday cheer, then consider paying forward the next time you stop in for coffee. I think I will do the same.